A chilly gray rain may have been pelting down this December morning. But, it's never too cold for ice cream. Welcome to Day #7 of Chocolate and Brazil Theme Week—a perfect time to imagine being in tropical South America, perhaps walking down a beach and biting into a Brigadeiro (a popular, home-cooked, round chocolate confection in Brazil that involves combinations of condensed milk, cocoa and other ingredients, festively topped with chopped nuts or sprinkles. Today's Tres Leches Brigadeiro Ice Cream from Haagen-Dazs (owned by General Mills) was part of the company's "Artisan Collection" of ice cream flavors, created jointly with smaller food speciality purveyors. 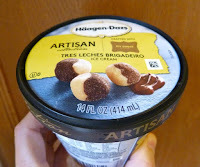 For example, today's ice cream was a mixture of Haagen-Dazs ice cream and My Sweet Brigadeiro (New York) content. 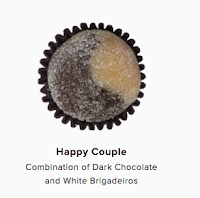 Latin-inspired Tres Leches ice cream was paired with My Sweet Brigadeiro's "Happy Couple" (a combination of dark and white chocolate flavored) Brigadeiros (pictured). Lovely rich idea. 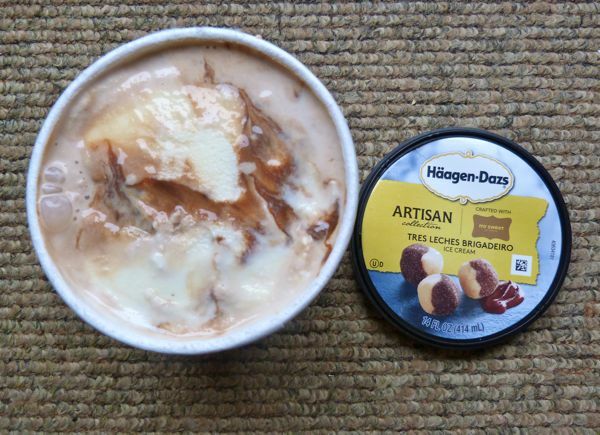 The resulting ice cream was a sweet, marbled blend of vanilla and chocolate with a hint of caramel flavor.